LAST Saturday I woke up to rain pouring in torrents, and bearing down on my neighbor’s newly extended roof like the thump-thump of a tin drum. I slowly got up after doing little cat stretches, even as my left shoulder slightly bewailed the sudden activity after an eight-hour lull. I slowly turned open the vertical blinds on my window and peered out. The sky was empty of color, as if mirroring the equally bland wet pavement down below. 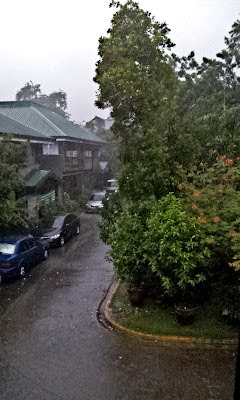 Across my bedroom window, the trees and shrubbery in our subdivision’s mini-park were soaked to their roots; I imagined the soil trying to scream as it drowned helplessly in the downpour. The swings and the seesaw in the playground stood mute and uncomplaining, even though they longed for the neighborhood kids’ regular playful abuse. In a past life, I would probably dread days like these, which can be a tad depressing or, at the minimum, dull and boring. As children longing for sunshine and play, the rain presents a formidable enemy to our joyful outdoor engagements. Now grown up and, ahem, older, the rain has become a calm and tender soundtrack to bedtime diversions with some significant other of the moment, or just a soothing lullaby that makes oh-so-precious sleep more possible. “Bed weather!” as we like to call days like this. It was nice to lounge in bed a little while longer, with no pressing appointments, nor any story assignments needing attending to that day. Normally, I would switch on some Pat Metheny on my iTunes to provide some jazzy counterpoint to the sound of rain, but this time I turned to Rumer to paint the smile on my face which only then was just a thought forming in my head. I didn’t notice I had dozed off again. It was close to noon when I finally hauled my carcass off the bed. I did a few exercises to give life to my pained shoulder and arm, and to cleanse my lungs and diaphragm of the stale evening air. 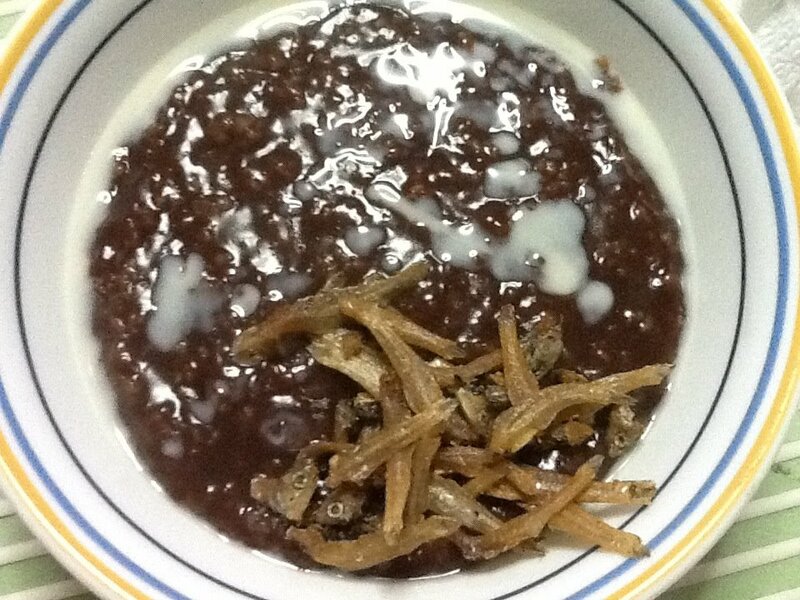 Leaving my bedroom finally, I called out to my mother’s caregiver, asking if we had any champorado in the pantry. Delighted with her positive response, I asked her to fry up some dilis, as well. Just the perfect combination to an increasingly perfect day. As I sat at the dining table, mixing soymilk and coco sugar into the lumpy porridge sprinkled with crispy dilis, Joss Stone this time was picking up the pace, tracking my growing exuberance. A spoonful of the warm comforting porridge and even my tummy was singing. As I read on my iPad, my usually chatty Mama was plunked lazily on the living room couch across to where I was, peacefully reading her newspaper. The caregiver, meanwhile, was going about her chores unobtrusively in the kitchen. Such calm. Be someone who I could get into. Perfect days are increasingly hard to come by. In fact, I notice that as I march toward impending senility, they come fewer and far between. The stress of daily living, and the growing weight of domestic burdens quickly sap my energy, unlike, say, two decades ago, when catching my breath was hardly something I worried about. But when those perfect days do come, I discover it’s just the tiniest of ingredients that combine to make them so. A shy glance from a beloved, the crush of white cool sand underneath my toes, a gurgling water fountain feeding into a pond of colorful koi, or, yes, perhaps just that teeny ball of foie gras playing on my tongue. You can’t stage them; perfect days usually happen unexpectedly, like an infant’s clumsy first kiss to his mother. It’s always a surprise. I think of them as God’s whispers, reminding us that whatever turmoil we’re experiencing, He is here, not in some far away palace above the clouds. We only have to be still, and listen. SADLY, we can’t realize a perfect day if we don’t have the unpleasant ones in between. On Tuesday I woke up at an ungodly 5:30 am and, for some strange reason, reached straight for my iPad and opened Facebook. There I saw posted on my wall was a message from Mr. Caps that our friend and media colleague Nixon Kua had already passed away. It was an incredible shock…many of us had been fervently praying for his speedy recovery, even if we knew that the possibility was remote. But I had experienced a few miracles vicariously, so I had no reason to doubt He could make just one more. It wasn’t to be, however, in Nixon’s case. As a journalist, I have practically become immune to acts of violence perpetrated on others. I read these stories of crime in the papers, or hear about them on the news, and I am hardly moved. But when it happens to someone you know, it lays heavily on the chest. I couldn’t help but weep, as I fingered the beads on my rosary, praying for the repose of Nixon’s soul. It was a senseless killing. A sudden cruel punishment for his family and friends. What did this kind and generous man ever do to deserve to die the way he did? My shoulder started aching more intensely than usual, screaming at the incredulity of it all. It was such an incredibly depressing morning, and one I would probably be hard-pressed to forget in a long time. My sincerest condolences to the Kua family. We stand with you in your time of grief.